These days, our interactions are often divisive–without any sincere attempts at understanding one another. The result: people act without kindness, empathy, or respect for others. Quickening of Compassion Cards are a tool to change that. The cards harness the power of compassion through photographs, meditations, and action steps, all designed to help you create a more compassionate world. Inspire deeper thinking about our history and ourselves. Promote productive conversations on difficult issues – immigration, discrimination, and poverty. Generate new ideas about social justice. Provide specific activities you can use to practice compassion. 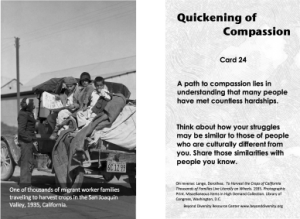 You can use the Quickening of Compassion Cards alone or in a group setting. Compassion asks us to live up to our best values, and the cards can help. 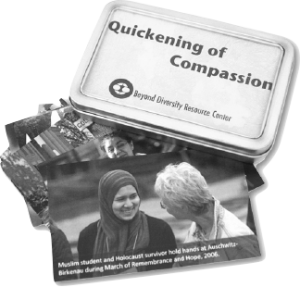 Quickening of Compassion Cards are great conversation starters for people interested in authentic dialog. With practice and through compassion, you can open your heart – even to people with whom you strongly disagree. Compassion asks us to live up to our best values and Compassion Cards can help the process. A study guide is provided that offers more detailed instructions on how to use the compassion cards. See the link below to download the study guide.